The Lo-Down: Would Fewer Subs Mean More Exciting Volleyball? If any of you take time out of your day to check Twitter, I am sure you saw the man with all the answers, Coach John Cook, tweet about how he believes the sport of volleyball has an opportunity to create the same excitement that the men’s basketball tournament has during the month of March. We have heard him say it before and we will hear him say it again – volleyball would be a different game if only eight subs (instead of the current 12) were allowed. Or even six, which is rule the rest of the world plays with. So, let’s “dig” into why that is such an important topic to Coach Cook and a possible make-or-break within the volleyball world. Reducing the number of subs gives players more experience playing all the way around. For example, Annika Albrecht only played back row her first three seasons, and she would sub in for a front-row outside attacker. Nebraska did this because it had a really good front-row attacker who wasn’t great at defense. Anni was a great defender, but wasn’t the most physical in the front row. Therefore, she only gained experience playing back row, and the front-row attacker only gained experience up at the net. This switch also took up multiple subs throughout a match. When Anni transitioned this season into playing all six rotations, she had a lot to learn in the preseason and became better and better as the season progressed, but it doesn’t always go that smoothly. 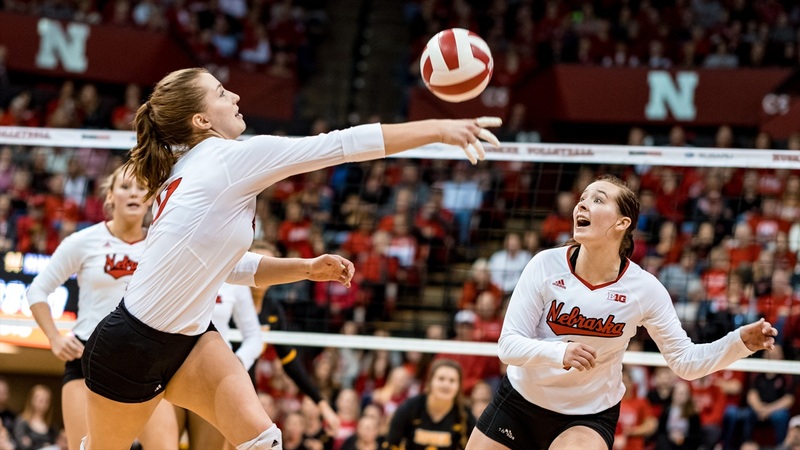 Anni grew into her role as a front-row player and saved the Huskers a bunch of subs along the way in 2017. High school girls often also specialize in only playing back row or front row, therefore all-around development is stunted at an early age. If that continues in college for a player who hopes to compete professionally, that player is in big trouble because she may not know how to play all the way around. Only six subs are allowed at the professional level, so those specialized players aren’t highly sought after, unlike a player who can pass, attack and play defense. Volleyball is a fast-paced game. Sometimes plays happen so fast the crowd doesn’t know if the ball landed on one side or the other. When a team like Penn State or Texas starts making multiple subs throughout a match it’s so their big front-row attackers don’t have to pass and play defense. It slows down the speed of the game, and can be a way for coaches to try to stop or slow momentum. Coaches will sub if they are out of timeouts or want to try to slow things down. All those stops and starts can make it hard for a player to maintain a rhythm and keep her body operating at peak efficiency. Overall, volleyball should continue to be a fast-paced game and the more subs there are the slower it becomes. When you look at how volleyball stacks up against football, men’s basketball or baseball, it sometimes can’t compare. With little TV, radio and print coverage, it is hard to compete. However, women’s volleyball is drawing in more and more fans each and every year. Ratings continue to go up, especially during tournament time. And the sport has evolved. The switch from side-out scoring to rally scoring for example was a move made to make the game more exciting, leaving fans on the edge of their seat whether they are at home or in the crowd. I do agree with Coach Cook that over time there are changes that can be made to help the sport of volleyball be just as enjoyable, exciting and memorable as going to a football, basketball or baseball game.